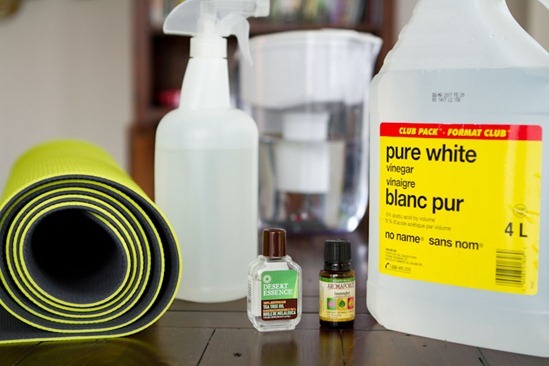 This time, I pestered you for tips on homemade or store-bought yoga mat cleaners. It turns out there are a million and one ways to clean a yoga mat. Or maybe more. What began as an innocent journey into making my own mat cleaner, turned into a ton of reading and researching online. There are as many different options as there are opinions on what to use. If you make your own mat cleaner, chances are you have your favourite mix. I think a good place to start when figuring out which mat cleaner will work for you is to check with your mat brand and see what they recommend. The “right” cleaning methods and ingredients can vary a lot from mat to mat. Of course, I didn’t take my own advice! I started by making my cleaner first, only to find out later from a discussion with my mat brand- Lululemon – that they don’t recommend using essential oils on their mats because it can clog the pores of the mat. However, I’m in the market for a new mat because my mat is cracking all over the place. The Manduka pro mat (or maybe the lite?) is high up on my list right now since it has a lifetime guarantee and is rated very well. I’m still not sure though. I went on Manduka’s Facebook page and asked them if essentials oils would clog the pores of their mats. good to know! I suggest checking with your mat brand to be sure. I did a lot of reading online about various homemade cleaners and most people suggest using white vinegar. I used 1 part vinegar to 3 parts water, but the mixtures can vary a lot. You can also use witch hazel or lemon juice, but I find white vinegar to be more cost effective. If you are concerned about using vinegar on your mat, you can try using alcohol-free witch hazel which I’ve heard also works. Essential oil (about 10-30 drops depending preference) peppermint, lavender, and thyme are nice, but use anything you like! 1. Place all ingredients into a large spray bottle and shake before each use. 2. Spray down your mat on one side and let it sit for a few minutes. With a damp cloth, wipe it down. Finally, wipe it with a dry towel or simply let it air dry. 3. Repeat on other side. Thanks to ehow, 3 Healthy Chicks, and Eco Yogini for the tips. Obviously this isn’t the only solution for cleaning your mat and I will probably play around with different methods at some point! If you want to give your mat a super deep clean, you can place it in a bathtub with hot water (just an inch over your mat- not a full tub), some vinegar (maybe 1 cup? ), and essential oil and let it soak for at least an hour. You can then rub it down on both sides with a soft cloth while it’s in the tub. Rinse it and then hang it on a clothing rack until completely air dry (note: this can often take 48 hours to dry completely, so be warned). Also be careful with using liquid soap in your cleaner because it can get into the mat and suds can seep out while you practice. Some people get away with just adding a couple drops to a big bottle of water though, so I really think it depends on how much you add. It’s a wonderful balance of cardio, strength, and flexibility (and might I add, my spiritual practice and emotional well-being). I feel stronger than I think I ever have and I look forward to the variety each day. My knee has been feeling great for the past couple weeks, so yesterday I finally decided to go for my first run in a month. It went very well and I had zero pain, although admittedly, I felt a bit out of my running groove. Regardless, it felt so good to be out there running again, even if it was just a shorter one. My plan right now is to slooowly build up my running, while still enjoying my other classes for variety. Injuries are frustrating, but sometimes they force us to try new things and discover a passion in other forms of exercise. For that, I’m very grateful. 3 Ready-in-a-Jiffy Warm Weather Snack Recipes! Glad to hear that your knee is doing better. Getting back into running after a little hiatus is always tricky – things just don’t seem to cooperate! I’m trying to use that to keep my momentum going and stay “on the wagon” until I’ve completed a half marathon – I’d hate to get close and quit and have to battle it back from square one all over again! Check out Jade yoga mats. My all time favorite mat…espeacially for hot yoga. The Manduka mats are extremely heavy and a pain to carry after an intense class. And since they don’t absorb I find that I slide around a little. Jade mats are great for hot yoga they grip the floor and are super light to carry. Thanks for the tips, I will check them out! I have to second this!! I treated myself to a Jade mat for my birthday a few years ago and have never regretted it. I find my hands really “stick” to the Jade in a way that they never did with my Lululemon mat. It may be hard to find everywhere, but I KNOW that they carry them at Kula Yoga (there’s one in Burlington and one in Oakville) and they are worth the work to track one down. Also check out “the mat” at lululemon. It’s a mat that doesn’t need a towel and is slipless. It’s my favourite mat. BUT, you can’t use a tea tree based cleaner on it because its an oil based which takes away from the mats ability to absorb your sweat. I use a lemon water cleaner on mine. I love this mat, no slip, no towel, no fuss. The best mat I’ve ever owned and I do a lot of hot yoga. Also to clean “the mat” from lululemon you just fill the bathtub with antibacterial soap and water and let it sit for a while and then just hang dry the mat. 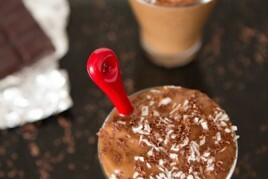 Try “the matt” from lulu!! Its the best. I have a Manduka and a Jade, the manduka turns into a slip and slide as soon as I start to sweat (and yes, I waited out the breaking in period). The Jade is amazing, I never ever slip and I am a sweaty person. I quit going to one gym because it almost got shut down by the CDC because so many people got staph infections. I’ve had my Manduka for three years, and it looks as good as it did on Day One. They’re HEAVY but worth every penny. I was going through 2-3 sticky mats a year before I bought the Manduka. Ive heard this from so many people. I think if it’s that durable it’s worth it! Do Mandukas slide on carpet? I’m looking for a good mat to do plyo on, and I don’t have hard floors. Nope! I use mine at home on carpet and it doesn’t slide around at all. The Manduka BlackMat Pro is amazingly durable. I’ve tried an “Eco” version at the studio I teach, and I don’t find them as good. Because they’re made to biodegrade, they wear down faster (whereas my Pro mat looks new after 2 years of regular use). I believe that buying something which is not necessarily from eco-friendly materials, but will last a lifetime, is way better for the environment anyway. Not all Manduka’s are created equal! Keep that in mind. I’m so glad your knee is feeling better Ange! Maybe a rest was all you needed. Very cool about the no-pore Manduka mats as well. Your cleaner recipe sounds fantastic – I’d love to make a vanilla scented one! I’d probably need tons to mask the vinegar smell though. Hmmmmmm…. Didn’t know you were injured…I have a trapped nerve in my hip and the moment preventing me from running…it’s been a week and a half and I’m missing it but trying new things…strength training and the cross trainer are my new friends and plenty of stretching. It’s given me time to reflect. I was clearly over doing it…you’re right, things like this happen for a reason! Yea it was an unfortunate incident lifting a huge box of my cookbooks…lol. Never again! I LOVE the new header!! And the natural DIY cleaner! That’s awesome. Also I know just how you feel about being out of your running groove. I slipped two discs in my back last winter and my comeback to running felt so slow and laborious. But before you know it you’ll be back into it and you’ll never remember feeling out of it :) Glad you were pain-free! I have two mat suggestions. The Manduka Pro and the Jade Yoga Harmony Professional Yoga Mat. The best mat for you depends on your practice. I use a Manduka PRO mat and it is indestructible. Many of my friends have had their Mandukas for years and years and the mats are no worse for wear. The mat also has a great “stickiness” that holds up serious sweating; however, I have noticed that some people also use a yoga towel with their Mandukas during the summer. I used to use a Jade mat and I loved it. It’s naturally sticky, grippy and cushioned. The natural rubber acts like sponge, so sweat is no problem whatsoever. Unfortunately, it is so natural that it biodegrades (not necessarily a bad thing). Eventually (after about 2 years) my Jade mat started to wear down. I continued to use it for another year, but eventually frequent jump-backs and jump-throughs took their toll. I ended up wearing down the front and back (down-dog positioning) down to nothing. Also, tiny bits of the mat ended up all over the place! After I could not longer use my Jade mat, I switched to Manduka. Oh! And, of course, I love your blog! what kind of heart rate monitor is that? how much did you pay? 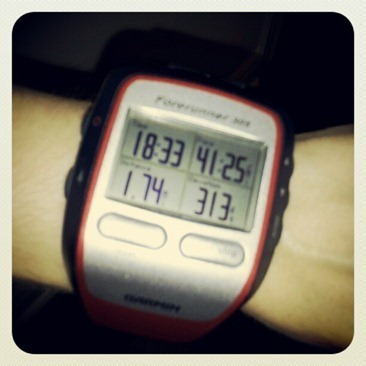 Hey Sophie, It’s a Garmin Forerunner 305 (purchased from costco- sorry I cant remember the price…I think it was $150? ), anyways I’ve tried a lot of sports HRM watches before and this is the first one that I have had NO issues with. I couldnt recommend it more. I’m glad your knee is feeling better!! I definitely recommend the Manduka mat! We have 2 of the black pro mat in our house – one of each size (71″ & 85″) – that we’ve had since 2006. They are WELL loved and still holding up great! I use them for all sorts of stuff from yoga to plyometrics to abs to a cushion for my weights during resistance training to keep them off the hard tile floor. When we got them originally, I got the longer mat for my husband & the shorter mat for me (I’m 5’6″). In retrospect I very much enjoy the extra length on his mat and use it more than mine, so I’d recommend the longer one if you like a bit more room to wiggle. It is a HEAVY mat to carry around and not cheap, but IMO well worth EVERY penny. And when I start to get fussy about the weight of the mat, I remind myself I’m going to WORKOUT so the weight of my mat is just helping me in my task. :) Hope that helps! Thanks Debbie, Im glad to hear this! Great tips! I am jealous of your yoga routine – I must get back to mine. I always feel so much better when I am practicing – so why do I deny myself that? I seem to be so all or nothing with exercise… what are your tricks to stay consistent? I just tend to do what I enjoy and that can change from time to time, which I think is ok too! Sometimes I feel like doing more of a particular activity while othertimes not. I always say listen to your body and what it needs. That being said, sometimes I can fall out of things I love (like yoga!) and it just takes one class to get back into it (or one run, strength class, spinning, biking, swimming, etc)…so I say just do it! The hardest part is showing up. I love love love yoga!! I wish I could do it more!!! I’m embarassed to say that I’ve never cleaned my mat (hides face in shame). That’s largely because all of the advice online is so conflicting! I’ll have to get on top of that – thanks for the reminder! Um… I feel so gross that I’ve *never* cleaned my yoga mat. I can’t believe I just admitted that. Well, now I know how! Thanks for giving back the advice others have given you! I love my Manduka Pro mat. I got mine from LuLuLemon and I got it in purple :) It’s super heavy though so it wouldn’t be easy to transport to class if you were say, biking or walking. You could do it but it might be a little awkward. Thanks for the tips on cleaning mats! Think I’m going to have to do a deep clean to mine this weekend since it’s been a while… oops! I dont think I ever thought about yoga mat care this much! I usually just clean with water, no wonder they are never clean. :-) Thanks for the tips! Sounds like a great variety of exercise! Are you able to do it all at 1 place? I love variety… But I belong to a spinning studio which offers spin and gravity – which I love. Doesn’t leave a lot of money for yoga! Though I try to make it to a hot yoga community class every week or so. I love my manduka yoga mat! Definitely recommend. They are on the heavier side though, depending what model you get. Right now Im trying a couple places with intro passes, both of which have lots of variety in their classes. It will be a sad, sad, day when my intro passes run out. haha. Thanks for sharing your exercise routine!! I teach classes 4 days a week (and two of those days are back to back spin and bodypump). I try to fit yoga in on two of the other 3 days, but usually it only happens once. And another day I go hike, and the last day is rest. I would LOVE to add a “mini” yoga class after my early morning Tuesday spin class- i know that everyone would be all over that. Or at least a good 15 minutes of stretching! You reminded me that I need to really clean my mat. I wish I could afford LuluLemon products!! No prob :) Yea I find yoga after spin is amazing…it’s crazy how tight the body gets from a spin class! I just cleaned mine this morning using those bleach wipes… oops. Well, they are cheap anyway, and I do plyo on mine so there isn’t a whole lot of sweat going on them… but I’ll keep in mind there is a more natural way! As a Fitness Professional, I am loving the routine you have been following. I give you 2 thumbs up. I am so happy your knee is feeling better too and it is just like you said, a great balance of everything tied in. Best part=mental practice too! So thaaaaaaat is how you clean a yoga mat properly! haha, I just hose my down. :/ Thanks for the info, will be trying it out. Thanks, I appreciate that! It definitely feels like a nice balance. Ive had my black manduka pro for over a decade and have hauled it around the world, literally. I have spent thousands of hours practicing or teaching on it, and it still looks brand new. Best hundred bucks, give or take, that you’ll spend on an hour-for-hour return on investment! Thanks for your input Averie! I’m leaning more and more to that one. As I mentioned in my post yesterday, I’m dealing with injury now, and it’s so humbling. It’s smart of you to take it slow. I hope to begin running again in a month or so, so I’ll be starting small too! I absolutely love your blog! I stumbled on it a few weeks back and I must say I even went vegan for a while! It wasnt as easy as I thought, being already vegetarian and all! Plus, it’s super hard to find vegan friendly products in France! I understand about the ads…I have the same complaints. Might be changing things up this year, we’ll see. I love how yoga-centric your workout schedule is! Mine used to be very similar, though as the weather is getting warmer I am going off hot yoga – happens every summer! Then I get back into it as I start to feel chilly again :). Hot pilates???? I’ve definitely had my own addition for hot yoga, but had no idea that hot pilates even existed. So gonna be checking that out. Immediately. Any thoughts from anyone about the Manduka ProLite? Most people seem to love it, but there are a few very disappointed reviews I’m finding online. I do hot yoga as well, and so I’m concerned about slip factor. I am happy about the weight of the ProLite because I walk 15 minutes to yoga every day. My old cushy mat from a discount store is starting to disintegrate, so I’m interested in paying a bit of extra money and never having to replace my mat. Any ProLite fans out there? Suggestions on where to buy in Canada? The experiences you share are really inspiring to me, Angela, thanks for continuing to share with us! Id love to hear more about it too. So much great yoga variety! I haven’t been doing yoga lately (I’m not a huge fan of the classes offered at my university) but I might have to start up again. I miss how flexible and strong I was in my own body . . . great encouragement! Thank you so much for this post. The other day I noticed that I really need to clean my mat and I was contemplating buying a yoga mat cleaner…so glad I didn’t! Thanks for the new cleaning recipe!! I usually use water, tea tree oil, and lavender but I like the idea of adding in some vinegar or soaking it in the tub. I teach yoga and I use a Jade mat. Its a little lighter then a manduka, but equally as heavy duty. And it is always eco-friendly. All of my teacher friends swear by either the jade or the manduka – they are both so amazing. Good luck finding your right fit! I like to workout first thing in the morning but I love trying all of your delicious breakfast recipes after I am done sweating! What would you eat before an early morning workout? Thank you Pamela! So happy to hear that! I’ve been practicing yoga for 8 years and definitely have an opinion about yoga mats. :) I started off using regular sticky mats, but the double-thick kind and I layer 2 of them because I’m bony and need the cushion. I also find that they have the best grip. About a year and a half ago, I got a Manduka and I really don’t like it. I slip badly on it and find that it has absolutely no cushion; it’s hard and heavy. I went back to using 2 double-thick sticky mats. That being said, lots of people in my yoga classes (I do level 2-3 Vinyasa) love their Manduka mats and my closest yoga friend has gone through 3 Jade mats. She loves how the Jade feels, but they keep warping in her car, which is why she’s on her third. The spritual and emotional connection that I’ve made since starting yoga has been life altering. Hot pilates, I’d love to try that one! Namaste! All hot yoga & pilates talk has me thinking I need to try one … finally! Great job on the run! Its best to EASE back into things and always feels nice! I am a Pilates instructor. The way our machine manufacturer asks us to clean our equipment is with a spray bottle filled with water and 16 drops tea tree oil. That’s it! And good enough to use between clients! So vinegar is unnecessary, if you are not a fan. Adding a few drops of lavender or peppermint would enhance cleaning power and experience, of course:). Sounds like you have a great workout schedule now, I would really enjoy that week! Glad your knee is feeling so much better! I practice yoga daily and I am in love with my Manduka Pro mat for a regular practice! Usually not slippery, and just the right balance of cushion and firmness. The only drawback is the weight of the mat, but as long as you are not walking miles to practice, you’ll be okay. I also own a Jade travel mat. It is lightweight and great to throw in a suitcase, harder to clean and wears out more quickly. Good luck deciding! Just wanted to say that I use the exact same thing as a daily shower cleaner. 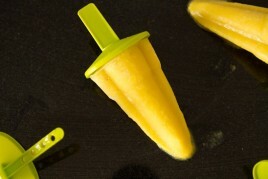 In an effort to cut down on chemicals in my home, I searched for something I could make that was safe and inexpensive. Turns out to be this recipe: 3 parts water to 1 part vinegar and several drops (I use quite a lot b/c my husband hates the smell of vinegar) of essential oil (we use lemon). It’s terrific!! Now you have a product that’s two for one! Glad you are feeling better. Injuries are never fun but at least you seem to have found other great forms of exercise while you heal. I have a Manduka Pro mat, and finally decided to spend the money after I kept shredding my regular $30-40 mats… I use my mat mainly for bootcamp, and plyo exercises so I cannot comment on how it faired for yoga. My sneakers kept shredding the mat, and the lifetime warranty was the selling point for me! I have had mine for about 8 months and have had NO issues! It is well cushioned, and non-slip! The regular manduka is not as cushioned, so if that is important to you I’d move up to the pro. I did’t know that you had the injury… But glad you are better now. Beautiful recipe, I have to make it for my mats. Yoga almost every day sound just amazing! I practice it daily also, and now started to involve my three years old. He’s doing a fantastic job, and it makes me very very proud! Just discovered your blog and it’s so inspirational!! I’m transitioning to a plant-based diet and love yoga too so it’s great to find such a perfect blog for me. The recipes look amazing and I’m going to try a few this week. Hi Angela! I’ve been following your blog for years and still love it. I hope your knee feels better. I’ve been battling runner’s knee on and off for about a year and it’s always challenging to stay active while trying to heal. Thank you I hope yours feels better too!! I try to clean it after each class….I swear so much in hot yoga! Hey there! First off, I absolutely LOVE your blog! I’ve been reading it for months and can’t stop pinning your recipes :) I just came across this post…I just got my Manduka Pro Lite mat in the mail last week and LOVE it! It came as a recommendation from my yoga instructor. You have to give it a few times, you know, to sweat into it for it to get nice and sticky but it’s fabulous! Happy practicing! What a great idea; my mat always smells so funky! Yes, I meant a mat…. thanks for the update. Great info, however, as a certified aromatherapist I have to tell you that the essential oil brands you have pictured above are likely not therapeutic grade (meaning, they may not have the anti-bacterial, anti-viral, anti-fungal, etc. properties you expect them to). Essential oils can be a great tool. However, the essential oil industry is unfortunately highly unregulated. Only 2% of the oils on the market that claim to be “pure” or “100% natural” actually are. The ones you can buy at run of the mill health food stores typically are not. I can tell just by smelling the testers, but that ability comes from years of using the good stuff (I have tried “aromaforce” before… not desert essence, but I assume it would be similar). Seek out oils that have the following info printed on the bottle: the latin name of the plant, the part of the plant used, the country of origin, and some kind of certification (though these are prohibitively expensive sometimes) . You may have to order them online. It took me a while to find a reputable source when I was living in Ontario. The following companies in canada i know to be good: ‘Quintessence aromatics’ (Saskatoon), and ‘True Essence’ (Calgary). They both ship anywhere within Canada (and True Essence is sold in Kingston, ON for sure, probably a few other places). Otherwise you could try ordering from ‘Young living’ (Online). Thanks for the info Lori! Getting motivation and energy for regular trainings is one of the most important things when you start working out. Otherwise you won’t achieve your goals. When I started going to the gym my friend advised me to try nutritional supplements. At first I thought I did not need them, but I changed my mind after I’ve tried. It was near 2 months I’ve been taking Military Grade nutritionals, when I realized I did not feel fatigue in the end of the day. And even more: after workouts I still had energy to spare. As time went by, my shape was improving more and more. I was loosing fat and gaining muscles. Now I feel really fit! Do you use distilled white vinegar or no? How long does this mat spray recipe last? Search benefact! its an all natural cleaner made of of thyme oil. We use it at my yoga studio to clean the mats and we also clean the studio/bathrooms with it. Thank you so much for sharing! I’m definitely gonna have to try this recipe. How was using the vinegar on your mat? 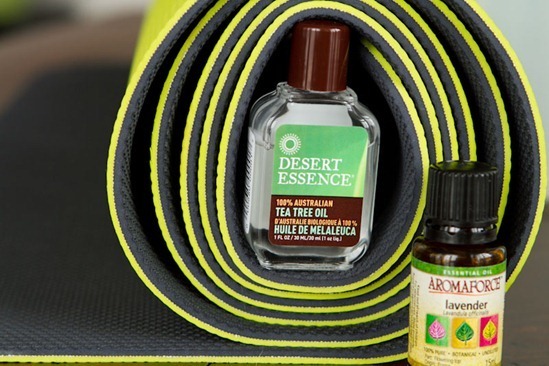 I love using vinegar to clean my yoga mats! I’m renting a mat from a studio right now, but planning to buy my own soon. Any tips on which mat to choose (Lululemon vs. Manduka or other alternatives)? For my spray I used witch hazel (also an antibacterial), tea tree oil and lavender oil. The lavender is not only an antibacterial, but it also smells amazing and helps promote relaxation which is exactly what I want to do when I’m on the yoga mat. Fantastic blog! I clean my yoga mat every time after my yoga class. I know it is too often but I think the mat is always dirty. I can`t bare the thought that it lay down the floor. Best regards! As long as I use my own mat I have not found it necessary to wash it. I have had the same very inexpensive mat for ten years and it is still flexible, sweet smelling, and has no cracks. Sometimes I think we clean things too much. A good shake and it’s good! I love this blog! So many useful tips. Hi, understand that tea tree oil is toxic to pets & my dog has a bad habit of licking off the floor. Any suggestion on a pet safe substitute? 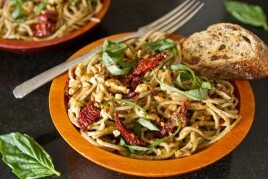 Great natural recipe to try! I am always looking for ways to live a simple + natural life! :) I will have to make this blend and try it on my mat for my next yoga session. Thanks for sharing! I got myself a eko mat and am just using plain water and sometimes febreeze to clean it. Am scared that the febreeze will ‘harm’ the mat and move on to just water only. Stores mat cleaners are very expensive 😝 Stumble upon your blog about DIY mat cleaning and wondering if the white vinegar are the ones that you use for cooking? Do we need to get organic or normal ones will do? So I know this is an Ancient post but I thought I’d recommend my new Favorite Mat since it took me foreverr to find a match for me. I found this one on Amazon and am so glad I did! I didn’t want a super cheap mat and also didn’t want a crazy expensive mat, so I bought on that is priced mid-range. Anyways, the brand is Youphoria in case anyone is in the market for a high quality (not crazy expensive) mat. Anyways, I wanted to clean my mat but wanted an organic way to do so – which is what brought me to this post! Thank you for sharing! 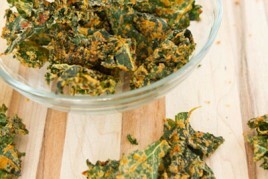 Previous post: 3 Ready-in-a-Jiffy Warm Weather Snack Recipes!